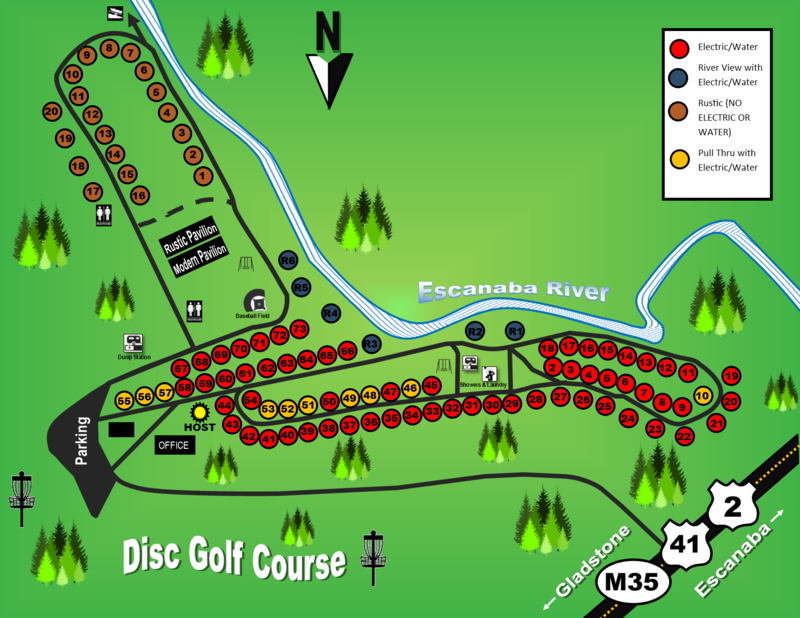 Pioneer Trail Park and Campground is a 73.57 acre park fronted by US Highway 2, 41 and M35 and along the Escanaba River. This park has a strong recreation tradition among county residents and its visitors. There are several picnic and playground areas, large and small pavilions, and a boat launch. The campground offers 20 tent/primitive sites and 78 RV/electrical sites with picnic tables and fire pits: the RV/electrical sites have 20-30-50 amps, and all include water. Amenities available to guests include showers/flush toilets, ice, firewood, vending machines, candy store, limited-WiFi, two dump stations, picnic and playground areas, ball-field, disc-golf course, and shoreline fishing on the Escanaba River. 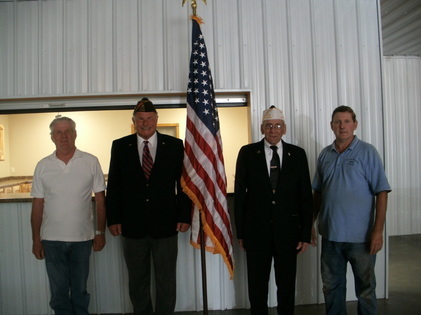 Commander, Rene Lippens and Vice Commander, Dave Wilson of the Delta County Veteran's Council graciously donated our Nation's flag to the Delta County Parks. Below is a picture of Steve Wery, Park's Manager, and Russ Ross, Delta Conservation District Board Member, accepting their donation. Need a Winter Storage solution for your boat/pop-up/ATV or jet-ski? CLICK HERE for more information! In early times, Indians and missionaries were known to have visited the area. About 1844, a sawmill was built (where the dam now stands) just west of the park. In 1851, that sawmill was sold to the Nelson Ludington Company and fostered a small settlement. The hard life of these early pioneers ended at their burial ground on the ridge that was later included in Pioneer Trail Park. The sawmill grew into one of the nation’s largest mills, the I. Stephenson Company. This company expanded by moving downstream to the mouth of the Escanaba River. The I. Stephenson Company, from its earlier land holdings along the lower River, sold the Pioneer Trail Park land to the County of Delta. In a contest for all the schools’ children, the name Pioneer Trail was chosen from 380 entries, to memorialize those early pioneers who passed this way. The entry was submitted by a young, John Bloomstrom.